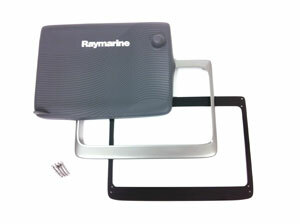 Raymarine offers 4 different helm station adapter kits that enable you to easily fit a new 9 or 12-inch MFD into the same cutout left behind by Raymarine C80, E80, C120, E120, C90W, E90W, C120W and E120W displays. Each kit includes a stainless steel adapter plate that uses the same mounting hole pattern as the old MFD being replaced. The new MFD's hole pattern is pre-drilled in the plate as well. Finally, an oversized snap-on bezel fits on the new MFD and completely covers the adapter plate. A rubberized suncover is also included with each kit. Note: The recently announced e165 Multifunction Display fits the cutout of the previous generation C140W and E140W directly. No adapter kit is required.